I have always loved a good fruit crumble, however the traditional recipe calls for butter, wheat flour and oats – all of which are not compatible ingredients for a dairy and gluten free diet. 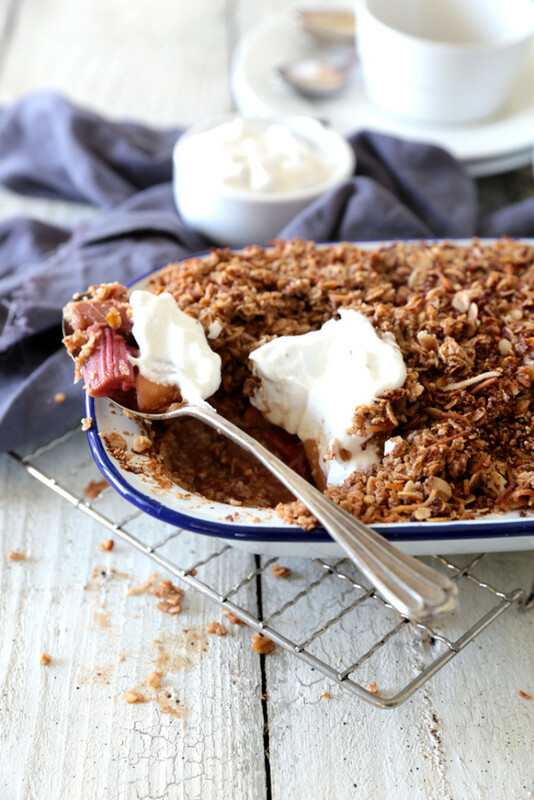 So it’s been a while since I have eaten a traditional style crumble, but when I saw some amazing, vibrant pink rhubarb in the store I became inspired to try and create a traditional crumble that I could eat. During my time as a pastry chef I developed a rhubarb crumble recipe that went on the menu at one particular restaurant (much to the head chef’s disdain, as crumble wasn’t considered particularly fine dining) and it became so popular it wasn’t allowed to come off until we came up with another best seller! I’m not sure we ever found anything quite as popular (New Zealander’s love their crumble! ), but it did eventually come off and the head chef no doubt breathed a sigh of relief. I think the key to the success of that crumble recipe was the following qualities: crunchy on top yet soft underneath; some chunky clusters of crumble mixed in with finer crumbs; threaded coconut; and just enough spice to have you wondering what that familiar flavour combination is. 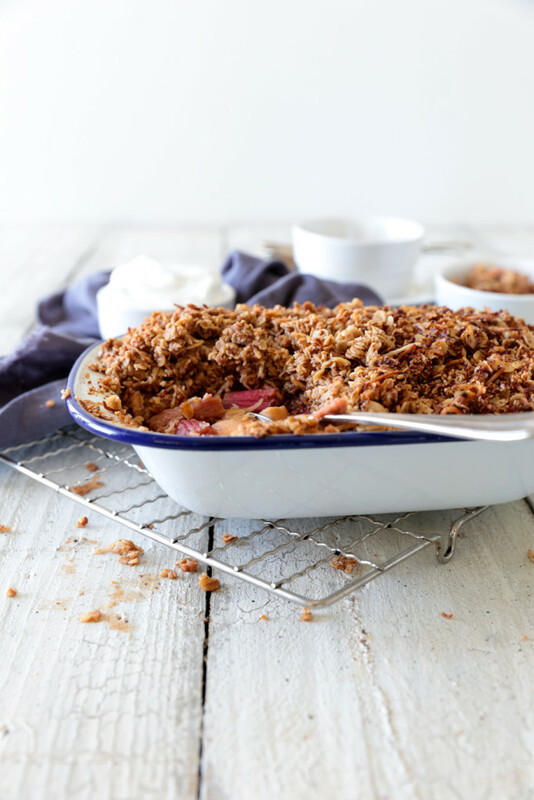 So with those qualities in mind I set about creating a new crumble recipe that was dairy, gluten and refined sugar free…. and I ended up creating two recipes. One with oats and one without, as some people can tolerate oats even if they generally eat a gluten free diet. You can also create quite a different crumble by using either pure maple syrup or coconut sugar as the unrefined sweetener. If you like a more chunky traditional crumble then maple syrup is the best choice, but if you like a finer crumble then use coconut sugar. One thing to note about coconut sugar is that it has a lower melting point so in a crumble it can burn a little around the edges at regular oven temperatures. The best way to avoid this is to cook the crumble at a slightly lower temperature e.g. 160ºC and keep an eye on it. For these two crumble recipes I have combined the oat topping with apple and rhubarb and the oat-free almond and coconut topping with blueberries and apple. However, which fruit and topping combination you use is entirely up to you and feel free to create your own fruit combinations using the quantities below as a basic guide. One of the things I love most about these crumbles is they are essentially the same as a healthy granola on top of fruit, which means you can legitimately eat dessert for breakfast!! If you have any leftovers they taste pretty good cold, or can be easily reheated and are perfect with a dollop of your favourite yoghurt. I used coconut yoghurt in these photos which goes amazingly well!! Hope you enjoy these crumbles recipes and if you post any pictures of your creations to Instagram I would love to see them – tag me @swoon.food and #swoonfood so I can find them. Enjoy! 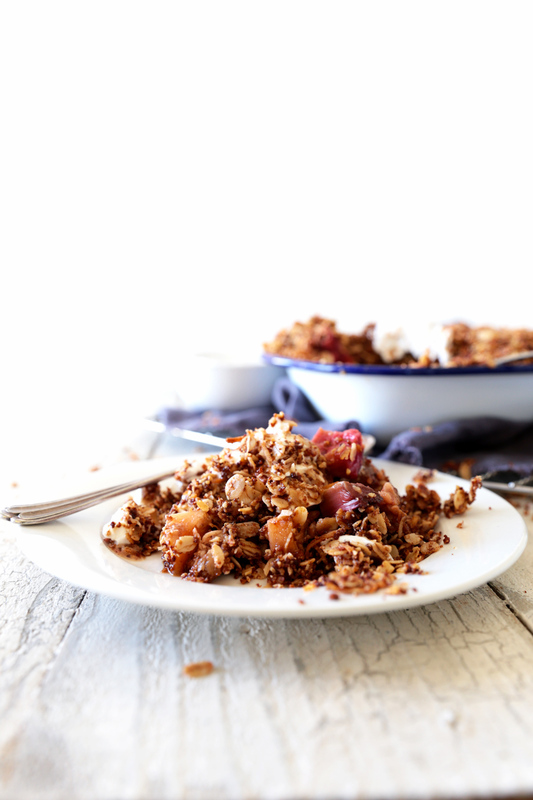 Do you have a favourite crumble combination? Or any questions about the recipes? Leave me a comment below, I love to hear from you! Preheat the oven to 170ºC. Wash the apples and rhubarb well, and peel the apples if you are not using organic. Cut the apples and rhubarb into small cubes about 1cm square, and place in a baking dish. Sprinkle with 1 Tbsp coconut sugar. To make the crumble place the coconut oil and pure maple syrup (if using – otherwise add the coconut sugar to the dry ingredients) in a small pan and gently heat until melted. Remove from heat. Combine the oats, almonds, coconut thread, cinnamon, ginger, vanilla and salt in a large bowl. Pour the melted coconut oil over the dry ingredients and stir to combine. Pile the crumble on top of the fruit and place the dish in the centre of the preheated oven for approximately 30 minutes. The crumble is cooked when the fruit has softened (and will be piping hot!) and the crumble has turned a golden brown. Note: coconut sugar will create a much darker looking crumble than maple syrup. 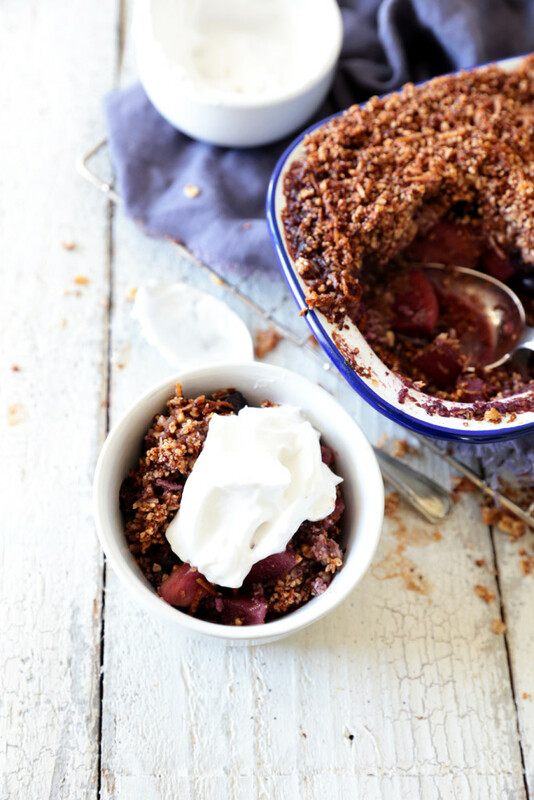 Serve large spoonfuls of the crumble topped with your favourite coconut yoghurt or nice cream. The cooked crumble will keep covered in the fridge for up to 5 days. Tip: If you don’t have ground almonds you can make your own by placing whole almonds in a food processor and blending until they resemble fine bread crumbs. Preheat the oven to 170ºC. Wash the apples and blueberries well, and peel the apples if you are not using organic. Cut the apples into small cubes about 1cm square, and place in a baking dish with the blueberries. To make the crumble place the coconut oil and pure maple syrup (if using – otherwise add the coconut sugar to the dry ingredients) in a small pan and gently heat until melted. Remove from heat. Combine the coconut sugar (if using), almonds, coconut thread, cinnamon, ginger, vanilla and salt in a large bowl. Pour the melted coconut oil over the dry ingredients and stir to combine. Serve large spoonfuls of crumble topped with your favourite coconut yoghurt or nice cream. The cooked crumble will keep covered in the fridge for up to 5 days.